That’s that, we live in century, when different speculation comes one after other. This film is exactly about that. A kind of continue of Den Braun roman “Da Vinci Code”. Film is separated in three parts, so we made our mind to share with some impressions and facts about every part individually. Story really is about that how mighty is religion and church. Have you ever thought about why church “has a due” of the tithe, it has a very strange relation with country itself, and it never pays taxes and it very often has no money? I think that we all have seen the Bible. Probably read New Testament. It’s strange, but no historian, who lived in that region, hasn’t left no evidence about someone so charismatically as Jesus, as the film authors say. Jesus character. Before Christianity, in ancient Egypt 3000 B.Sc. legend tells that Sun god Hors, who came into the world exactly in 25 December from virgin Izida. To his coming in world pointed three stars in the sky. Hors had 12 apprentices. One of them to betrayed Hors, then he was crucified and after three days he resurrected. Atos (Greece), Krishna (India), Metra (Persia), Dunois (Greece) were the same, with very similar born story, 12 apprentices and dying, resurrection time and way. The story about Jesus, we can find an astrological meaning. Sirius which is brightest star of Orion, showed in the sky in 24 of December after it, came three smaller stars called about “Three kings”, showed the place, where sun rises. Interesting fact from nature, that sun its going between solstice does in original way. Exactly in solstice (it’s 22 December) it, for three days, stops going to the South and is in its lowest point. After that it goes further, to put us understand that its resurrected. But this facts wasn’t noted till spring solstice (Easter), when the night and day length is equal. Magical number 12 is met very often in the Bible. Apostles were 12, Jacob had 12 sons, 12 Israel kings etc. 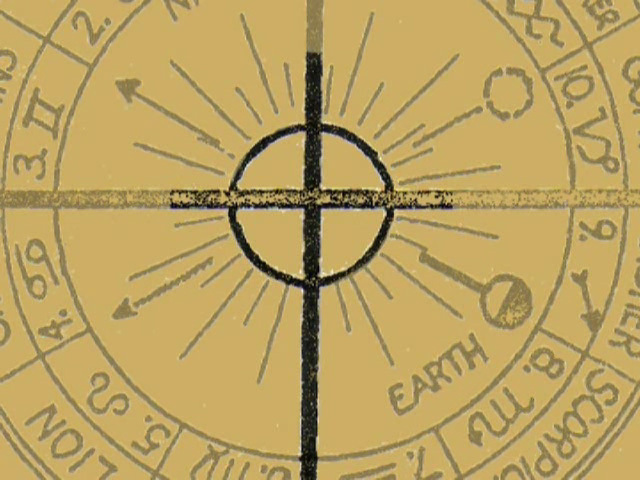 We need to mention that there are 12 zodiacal signs, which are put round the zodiacal cross, in which we simple can see Christianity symbol – Cross with circle in center. In the Bible we can notice a word “era” very often. Ancients know that approximately every 2150 years sun rises in other constellation. It’s just because earth axle vibrations. In order to go through all zodiacal constellation, there’s needed ~26000 years or how they called – Platoon year. Taurus era – from 4300. B.C. till 2150. B.C. Aries era– from 2150. B.C. till 1. B.C. Pisces era– from 1. B.C. till 2150. A.D. In the 2150 A.D. starts the Aquarius era. Every era is lead in by new prophet, which like law brings in himself new structure and symbolic. That’s how Moses led in Aries era, Jesus – Pisces era. Wherewith in conclusion of every era mark the end of earth conception. The first part of this movie is based on cognition, that Bible is theology and astrology sum.